As a first-time mother of 1-year-old son Eli, Ariel was hesitant to try the new “Mommy and Me” Music and Wellness program offered at the Orange County Rescue Mission’s Village of Hope in partnership with Pacific Symphony’s Heartstrings program. She had only been a resident for a little more than nine months and was still adjusting to campus life. The thought of meeting new people was intimidating, but she was optimistic that a class on how to connect with your baby through music would be beneficial to her and Eli, and decided to give it a try. 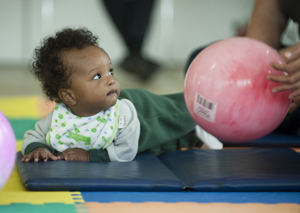 After the first day, Ariel thought the class was “weird,” because it involved singing to her baby and doing different movement exercises that drew her out of her comfort zone. A particular one that stood out was where she had to pair up with another mom to carefully swing her baby back and forth in a bed sheet. At first, she feared this wasn’t safe, but when she saw how happy Eli was, she felt overjoyed. “After a while I realized that it’s okay for him to reach out and try new things,” said Ariel, who would soon realize this lesson herself. Ariel found that she also bonded with other moms and their babies, and she wasn’t as intimidated as she had originally feared. An influential moment was when she saw a good friend who was usually very serious, having fun and letting loose for “once in her life.” This experience allowed the two of them to connect on a level that Ariel believes doesn’t happen very often. 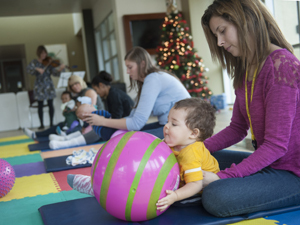 The “Mommy and Me’ Music and Wellness class curriculum is created and led by Maria Simeone, founder of MusicMovestheBrain, who uses brain-based music and movement to inspire and encourage growth in both mothers and their children. 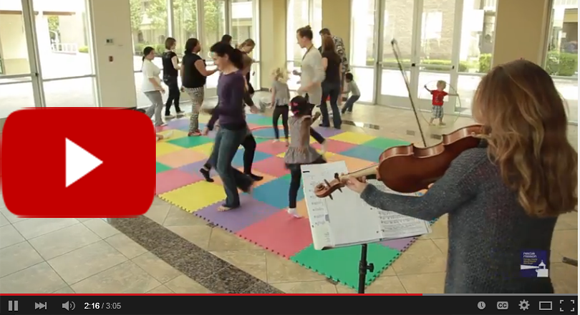 They include fun activities such as dancing, moving and singing to live music, thanks to Pacific Symphony musicians, violinist Dana Freeman and violist Carolyn Riley, who respond to the mothers’ and babys’ reactions in real time. Ariel and Eli learned together, experienced new and stimulating music, participated in exercises that strengthened their bond, and simply laughed and enjoyed themselves in a worry-free environment. It was somewhere they could be themselves and feel completely comfortable in their own skin, all while simultaneously growing. Throughout the program, Ariel noticed that Eli seemed more relaxed and comfortable wandering around and exploring the different activities and demonstrations; he was clearly developing emotionally and physically. “He went from three months of not moving…to crawling…to standing up…to walking!” she said proudly, proclaiming how much she enjoyed seeing him grow through the different stages. 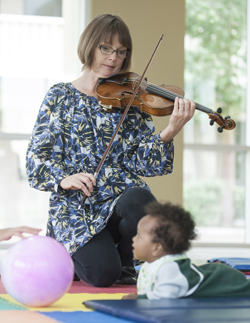 “Mommy and Me”, made possible in part by the generous support of the Ahmanson Foundation, is a seven-week Music and Wellness program that provides an innovative means of empowering mothers while providing a critically important neuro-developmental foundation for their babies and is held at the Village of Hope transitional living center at the Orange County Rescue Mission. These 45-minute classes focus on one core teaching concept every two weeks: “Space” (personal, group and musical), “Pulse & Rhythm” and “Balance & Symmetry.” Overall, the goal of the program is to help mothers and their babies improve communication, experience the power of the arts and learn different ways of self-expression, all while sharing in the joy of milestones like movement and crawling in the babies. The classes give mothers tangible, useable and effective skills that make parenting more productive and joyful. For more information on Pacific Symphony’s Heartstrings program, please contact Mary Hawkes at (714) 876-2339 or MHawkes@PacificSymphony.org.